Spoon 2 heaping tablespoonfuls of meringue onto a parchment-lined baking sheet; repeat to fill baking sheet, spacing 1" apart. Bake until dry, about 4 hours. Do ahead: Meringues can be baked 5 days ahead. Keep airtight at room temperature. Assembly: Whisk crème fraîche, mascarpone, powdered sugar, and rose water, if using, in a medium bowl. 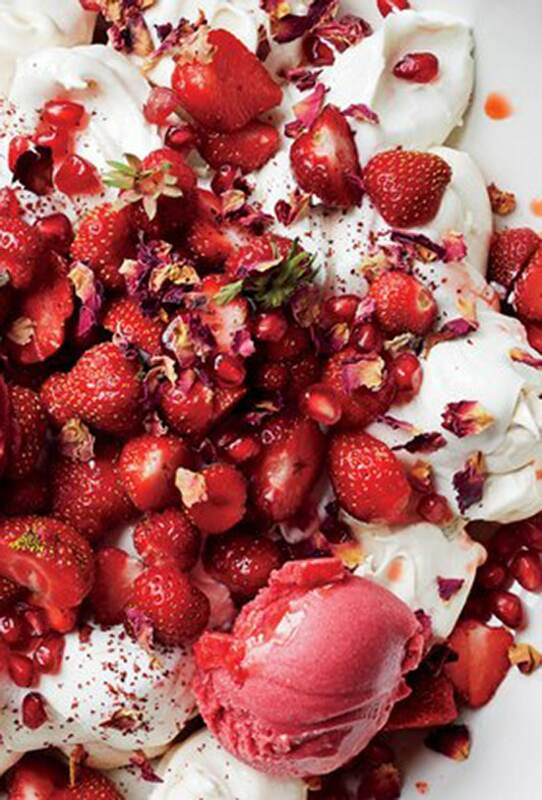 Arrange meringues, crème fraîche mixture, strawberries, and scoops of sorbet in a large bowl. Drizzle with pomegranate molasses and top with pomegranate seeds, sumac, and rose petals.